Is A Mortgage Assignment Sale The Solution For Buyers With Bad Credit? I was reading a blog post this morning from another real estate agent who was seeking input about a mortgage assignment sale (creative solution for homebuyers with bad credit that involves the assumption of existing loans). It simply involves the seller granting the deed of the property to the buyer subject to the existing liens on the property. 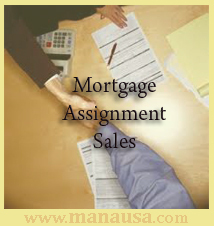 The topic of mortgage assignments is very hot among real estate investors, with many claiming the mortgage assignment sale as a great way to acquire a lot of property with very little money. If the seller is willing to pay closing costs, the whole thing could be done "no money down." But even if the buyer had to pay the closing costs, it would take 10% or less to acquire the property. Seems like a great way to sell property, right? Note: Did you subscribe to the Tallahassee Real Estate Newsletter? It's free and it contains great information for home sellers and buyers alike. Join the thousands of people who get the best analysis of the real estate market emailed to their inbox on the third Monday of every month, featuring charts, graphs, and analysis of the Tallahassee real estate market. A simple example of a mortgage assignment sale would a property owner who owes $240,000 on a home. A contract would be written for an amount that would include closing costs and the $240,000 owed on the property (most likely around $265,000). The buyer would bring $25,000 to closing and then would assume payment's on the loan of $240,000. The seller would be assigning the mortgage to the buyer, but herein lies the problem. The lender in most cases will not be made aware of the assignment, and therefore can call it due at any time. With times being what they are, most banks will be happy with a current loan and most likely will do nothing about this assignment (for now), but they still have the right to do so in the future. Imagine the buyer owning the property for three years, staying current on the loan the whole time, and then receiving a letter stating that the loan is being cancelled (called due) immediately. The bank would have this right. The buyer would be faced with four options. Of course, if a buyer goes into this with poor credit, it might be a risk worth taking. After purchasing a property through a mortgage assignment sale, the buyer would only be at risk for losing the equity gained and the initial investment, and if this was "no money down," there is not a whole lot to risk. But what about the property seller? Since the banks will not be releasing the seller of liability at closing during a mortgage assignment sale, the seller will be "on the hook" the entire time the mortgage remains on the property. Without a novation, the lender will still be looking at the seller for satisfaction. That means if a poor credit buyer purchases the property through a mortgage assignment and then defaults, the seller is the one who will bear the foreclosure process or other remedy resulting in the bank calling the note due. I cannot imagine a situation where the seller should be comfortable with a mortgage assignment sale. Seller's who are faced with a tough time selling their home have better options, and many of these sellers should consider a short sale, as it gets the property sold and these sellers can move on with their lives. If you own a property and are presented with an offer involving a mortgage assignment, you should seek advice from a Florida Real Estate Attorney. The strength of the buyer should weigh heavily on your willingness to take this risk, and most likely there are wiser remedies for you to pursue. Of course, if you receive an offer from a buyer pursuing a mortgage assignment sale, it wouldn't hurt to request the bank's approval for the assignment, and thus removing the seller from the loan. Great feedback Eric, thank you. As an experienced investor with contingency plans, this method makes sense for you. You write "I have never, ever, ever had the loan call due by a lender." I suspect there have been very few called due in recent years, with all the mortgage problems (and more importantly, declining interest rates). But what if rates shoot up to 9% in the next three years, would they want to call the 5% loans due? Again, for an experienced investor like yourself, I think it is a game of risk versus reward. But for many owner occupants who are not seasoned real estate investors, the mortgage assignment loan has too much risk. Well I acquired a property Subject-Too the existing financing. 3 years later the bank called it due. I lost the property, the seller got a foreclosure on his credit report and my tenant buyers had to move. The loan was current, never missed a payment. Trying to talk to the bank was useless, they have no common sense. I predicted to that idiot at the bank what would happen if they foreclosed on this current loan and it happened in detail exactly like I said. They ran up a bunch of junk fees and lawyer fees, it sat on the market for 2 years and they sold it for $25 grand less than was owed on it. I could of had my tenant buyers to the bank and got cashed out by then, however common sense was not in the banks favor.